The conversation below is from Mayor Tari Renner Facebook page. Krista Vogel Cardona was Renner’s campaign manager twice and the daughter of Steve Vogel. John Kraft is one of the Edgar County Watchdogs. The two names I redacted are private citizens and not the same person. If you have a Facebook account, you can see this post for yourself. I wonder who “Central Management” is and how they got the names and Tari’s PCard number? Posted in BloNo, Bloomington, Hales, Liberal Media, Local, Pantagraph, Renner, Taxes, WJBC.Tagged Edgar County Watchdogs, John Kraft, Krista Vogel Cardona, Mayor Tari Renner. The P-card is issued in his name, he signed for it, and he’s responsible for all purchases made on it as well. 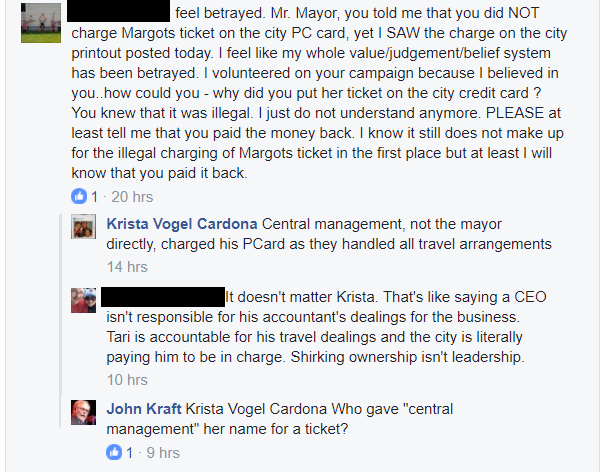 In fact , as Mayor, he’s accountable for everything. What a weasel, trying to blame someone else. If she reimbursed the city, they could prove that in a New York second. Stalling a response on proves that that Renners lying, again! Funny how Renner moved from “it’s lies” to “central management did it.” Even if the $$ is reimbursed, the illegal act was done and can’t be undone. Own up and face the music. Oh wait, maybe the delay is so Renner can talk to Chambers.